Download Registration Form "For Fax or Mail Orders"
Medical Billing Online Course - The medical billing course will provide you with the knowledge you need to operate a successful medical billing business. Click here for more information. Basic Physical Therapy Online Billing Course - This course will provide you with the most up to date information regarding physical therapy billing. Click here for more information. Introductory CPT Online Coding Course - The CPT coding course will provide you with the basics of procedure coding. Click here for more information. Intermediate CPT Online Coding Course - This course is designed to follow up our Introductory CPT Course. It is an intermediate coding course. Click here for more information. Chiropractic 101 Online Billing Course - This course will cover the basics of chiropractic billing and information on handling chiropractic accounts. Click her for more information. CMS-1500 Claim Form Course - This course will help you understand what information must be included on the CMS 1500 claim form in order to get a claim paid. Click here for more information. Our courses are offered in real time access. If you choose to enroll from here, you will be given immediate access upon verification of your payment information. If you have questions, call us at 580 622-5809 or email us. 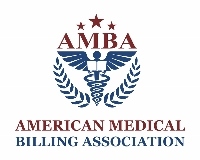 The American Medical Billing Association was formed in 1998 to help medical billers find the resources they need to be successful in medical billing. We provide resources, education and networking opportunities. We hold an annual conference and provide members with outstanding support on all areas related to medical billing. You can call our office anytime and we are happy to assist you in providing the answers you need. We also offer a free webinar each month that allows billers to earn free continuing education and we often have low cost webinars as well. AMBA has a Facebook page where we share a lot of information related to medical billing, coding, compliance, credentialing and specialty specific billing. Currently, we have 14 Facebook Groups, 2 of which exist soley for medical billing company owners to share information and network. See what medical billers say about AMBA on our Facebook page. Copyright © American Medical Billing Association 2018. All Rights Reserved.